The 3 day military diet is free and you don’t have to subscribe to any expensive programs or purchase expensive food or dietary supplements. All the foods mentioned in the three day military diet are commonly found in every household. Before going into the details of the 3 day diet, the first thing I would like you to know is that the military diet as claimed by many is not designed by the nutritionists in the US military for the soldiers. If anyone says so, don’t believe them. It is just a low calorie weight loss diet that helps you lose a significant amount of weight in a span of 1 week. On the first 3 days of the diet, you’ll be eating the suggested foods, which help you lose weight and on the remaining 4 days off, you’ll be eating either the 1200 calories (for women) or the 1500 calories (for men) in order to maintain your lost weight. As said above, the 3 day military diet menu is split into two phases, which lasts for 1 week. The first three days of the diet, you’re allowed to eat low calorie meals 3 times a day with no snacks. On an average, you’ll be getting roughly 1000 to 1300 calories per day. On the other 4 days, you’re free to have a healthy meal plan comprising of no more than 1500 calories per day. You can repeat the diet (3+4 days) several times until you reach your weight loss goal. There is a calorie restriction on the first 3 days of the diet plan to help you lose weight. The remaining 4 days off meal plan will help in maintaining the lost weight. Below is the exact 3 day meal plan you should follow during the first phase of the army diet. This is the day 1 military diet meal plan. It contains around 1,300 calories. Here is what you should be eating on the three day military diet day 2 menu. It contains around 1,100 calories. 1 slice of toast (whole grain). Here is the breakdown of day 3 menu. It contains around 1,000 calories. In addition to the military diet plan menu, it is advised to drink as much water as you can (at least 3 to 4 liters per day). If you’re a coffee addict, you can have it as long as you don’t add any sugar, milk or cream, which spikes up your calorie intake and thus spoils your diet. As mentioned earlier, this is the phase 2 of the Ice cream diet, where you’ll be eating healthy, but limiting your calorie intake to just 1500 calories per day. Women can go up to 1200 calories per day. 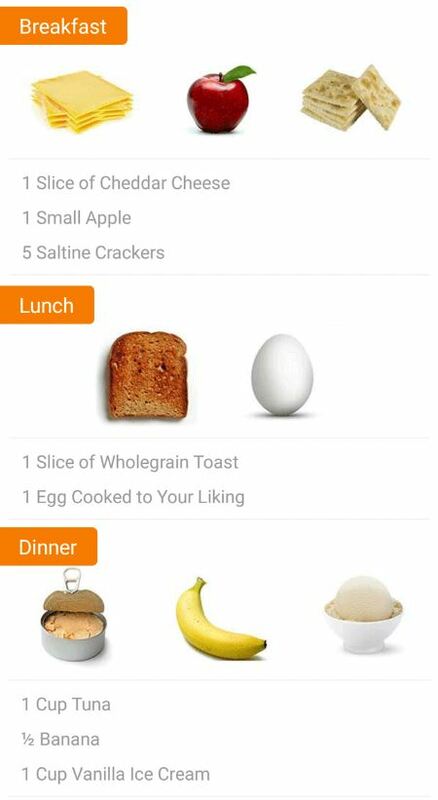 You can use the MyFitnessPal app to count the calories from the foods you consume. The only rule of thumb is to avoid any fast foods and include only healthy foods like vegetables, fruits and protein. Not everyone could eat all the foods and hence you’re allowed to replace any food in the 3 day diet menu with foods that contain the same number of calories and nutrients. For example, you can swap 1 cup of Tuna for a handful of almonds. This is good for vegetarians too. Not a fan of grapefruit? Don’t worry! Just add ½ tsp of baking soda in a glass of water and drink it. It has the same fat-burning benefits as the grapefruit. IS THE MILITARY DIET SAFE? ARE THE RESULTS SUSTAINABLE? Since the actual diet lasts for just 3 days, it is safe for an average person. But, if you start following it vigorously for a continued period of time (months at a time), then you may be in trouble due to lack of nutrients from such low calorie diet plans. So, don’t put yourself at risk by doing so. My personal advice: You can do it for a week, leave a gap of 3 to 4 days and then start it again. Don’t skip the four day off meal plan (Phase II), which is very crucial in helping you stay healthy. And coming to the sustainability, you can’t keep the weight off for long as this short-term diet isn’t helping you to change your eating habits. So, the weight loss results won’t last much longer if you go back to your regular eating habits. The three day Military diet is safe, but not meant to be followed for months at a time. Maintenance is the key to any long term weight loss results. Stick to a healthy eating lifestyle and you’ll definitely be able to maintain your weight. WILL I BE ABLE TO LOSE 10 POUNDS IN A WEEK? And as I said earlier, losing weight is easy, but maintaining is the toughest part. Start your day by drinking at least ½ to 1 liter of water. This will deal with cravings and thus help you avoid any unnecessary snacks. Pack your refrigerator with grocery before starting the diet so that you don’t have to get stressed out what foods to eat. This makes the dieting easier. You can practice the Intermittent Fasting lifestyle while following the three day military diet plan. This helps in improving your weight loss results further. Exercising will help you lose more weight compared to just diet alone. But, it is only advised to start heavy workouts during the phase II, as you’ll be having less strength on the first 3 days due to low calorie consumption. However, you can do regular jogging, walking or running along with some yoga and meditation during the phase I. Get a diet buddy and it will help you get motivation to continue (or stick to) the diet without failure. It is much better if the buddy is your family member. Don’t drink any alcoholic or sweet drinks as they contain nothing but empty calories. Instead, drink a glass of warm water with ½ slice of lemon (juice) whenever you feel of wanting a drink. DOES THE MILITARY DIET WORK FOR LONG? If you’re looking to lose some pounds quickly for an upcoming occasion or a wedding event, then the 3 day military diet menu is the best weight loss plan out there. But, if you’re looking for long term results, then you should not follow the three day military diet (or any diet program for that matter). The best way to lose weight and maintain it is by changing your lifestyle (healthy eating habits). It is the only recommended way to stay fit for a longer period of time.